Coconut cream or coconut milk is so flavoursome. I love using it to make different dishes to satisfy my family’s appetite, no matter savoury or sweet. 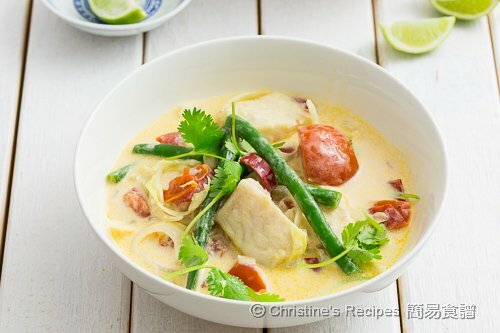 A case in point, I simply cooked some fish fillets in the fragrant coconut soup. 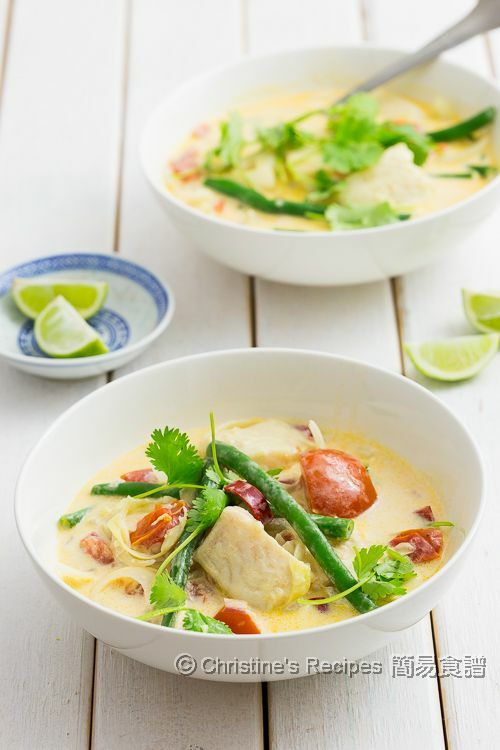 It turned out a dish full of flavours and packed with nutrients. It’s a no-brainer dish without any hassles at all. You may put any of your own favourite vegetables in it as well. Amazingly, I found that tomatoes go so perfectly well with coconut milk. I chose Roma tomatoes because they are meaty with a just-right tangy taste, which balance all other flavours in the soup. As we are spicy food lovers, I added a long red chilli to add a hot kick, served on steamed rice as a light meal. Rinse the fish and pat dry with kitchen towels. Cut into 4-cm/1.5-inch pieces. Season with salt, pepper and wine. Set aside for 10 minutes. Lightly coat with corn flour. Heat oil in a frypan over medium high heat. 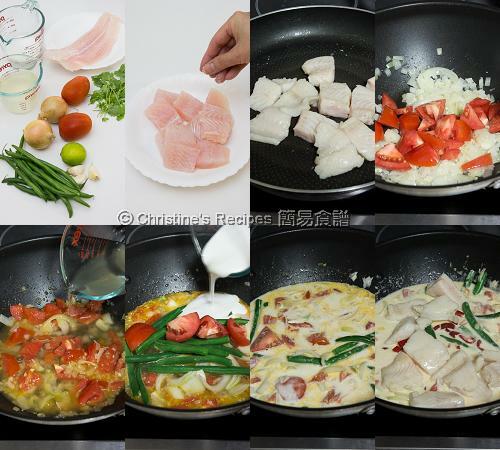 Cook the fish until both sides are lightly brown. You don’t need to cook through the fish at this stage. Set aside. Blanch the green beans in salted boiling water for 2 minutes. Drain out and rinse in cold water immediately. Set aside. Add oil to sauté onion. Push the onion to the sides of the pan. Add more oil to saute garlic in the middle. Stir to combine. Add half of the tomatoes and cook until softened, about 4 minutes. Pour in the fish soup. Bring it to boil. Continue to cook for further 3 minutes. Toss in the remaining tomatoes, shredded onion, green beans, red chilli. Pour in the coconut cream, followed by the fish. Cover and cook for 2 minutes, until the fish is done. Season with salt and pepper. Squeeze the lime and stir in the juice. Garnish with coriander. 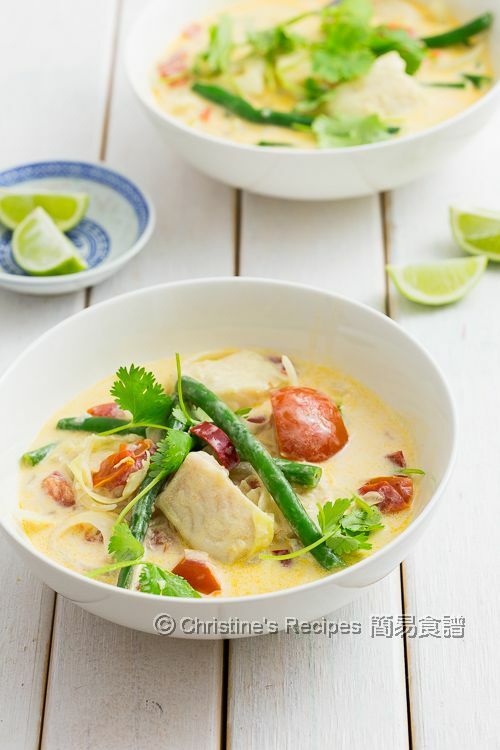 Serve hot with steamed rice, noodles or pasta. Enjoy! By rinsing the blanched green beans with cold water, it helps to keep their fresh green colour. I like to pan fry the fish fillet first, before adding into the coconut soup. It helps to release excess water and reduce the fishy smell if any. For convenience, you might skip this step anyway. To add more texture, half of the onion is added towards the end of cooking. Very very flavoursome and moreish! I really would love some now for my lunch!